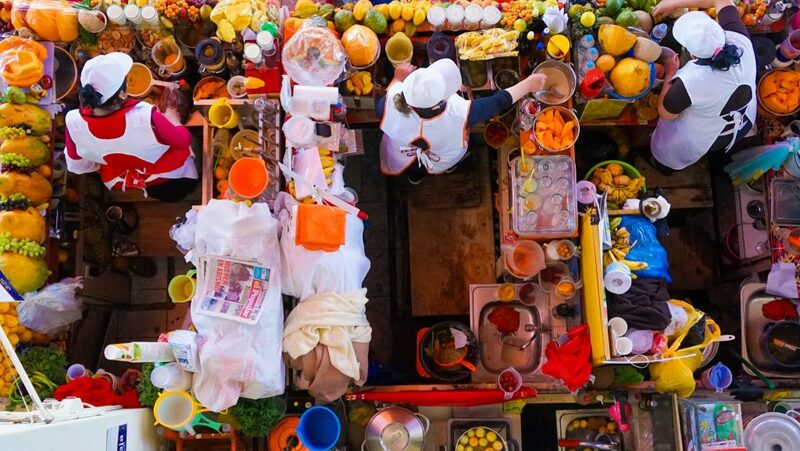 Lima might be the Gastronomical Capital of South America – but Arequipa, the UNESCO listed stylish cousin to the north is now giving it a solid run for its money. 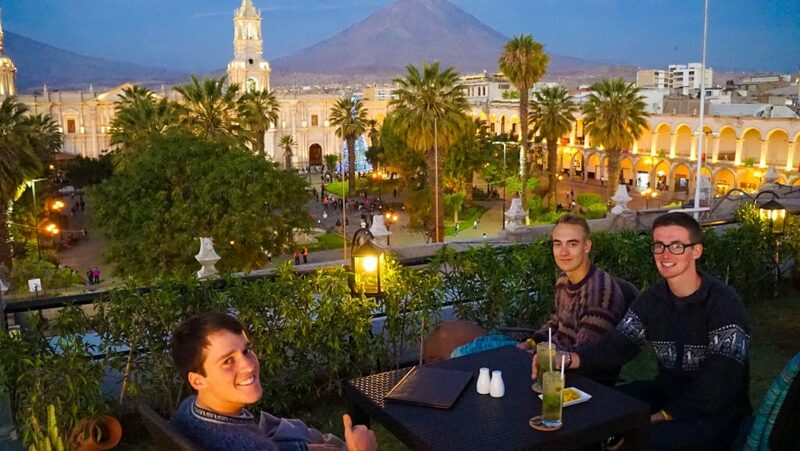 After plenty of horrible food in Bolivia we had been glutting for a delicious food day and having previously enjoyed the sights of Arequipa decided to spend the entire day having an epicurean escapade – enjoying the best food and drinks Arequipa had to offer, on a budget! It was truly glorious, and for all you Peru foodies out there I’ll now give you a run down so you too can check out these secret spots and hidden gems – living like a local while filling yourself with incredible flavours, sights and sounds! Enjoy! First Stop! Mercado San Camilo. Everyone knows the best way to start the day is fresh juice, and boy do the Jugos ladies here deliver. 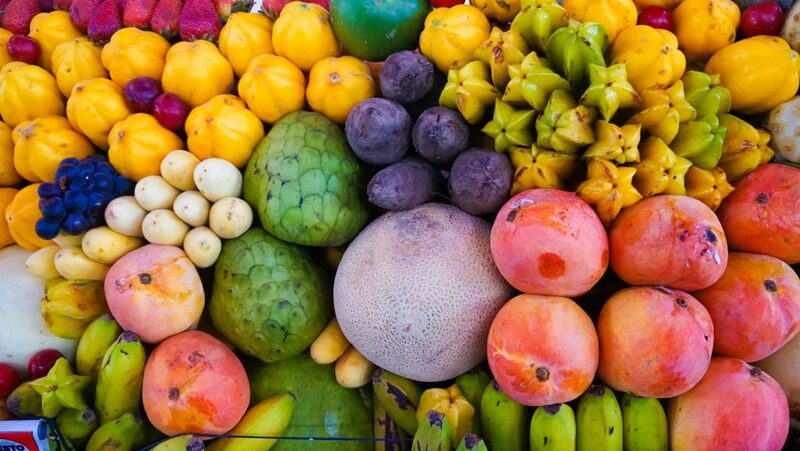 For less than 10 soles you can create your own masterpiece – lovingly put together by the delightfully cheerful juicers. I enjoyed fresh mango and milk but the best flavour combination had to be strawberries and purple grapes! You get a free refill as well, so if your not terribly hungry one between two is fine. 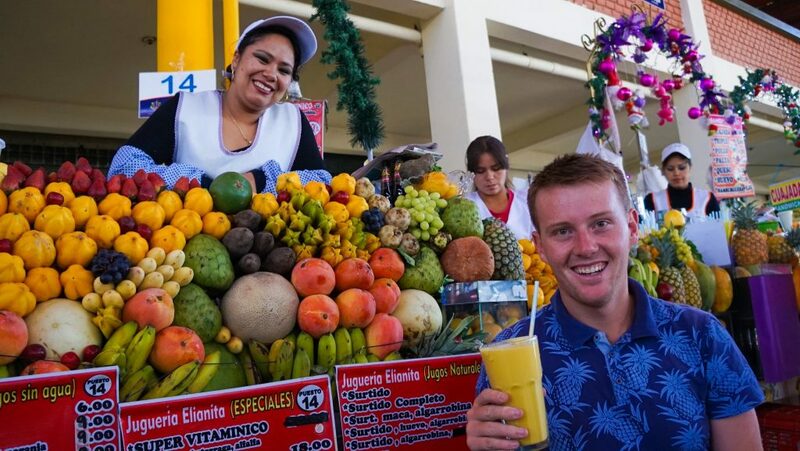 While you’re here perhaps grab a fresh, piping hot empanada or check out the local handicrafts on offer! Not to mention all the other weird and interesting things there are to find. Second Stop. Panoramic ‘Mirador de Yanahuara’. 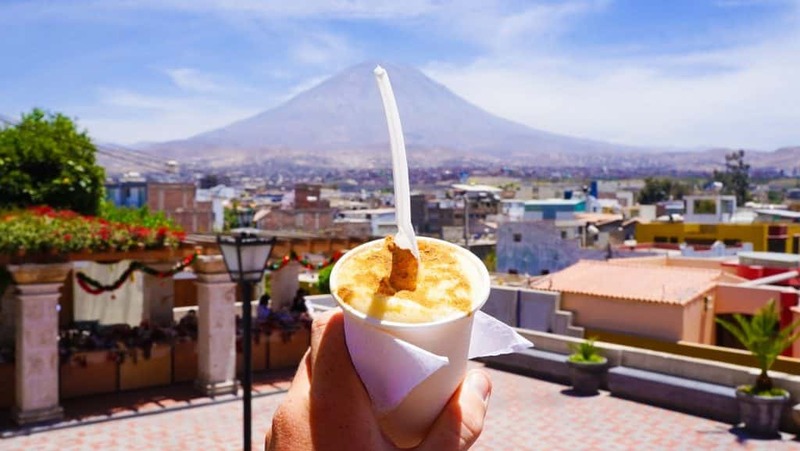 The view here over the city and surrounding volcanoes is awe inspiring, but would not be complete without a delectable Queso Helado – literally “cheese ice cream.”. 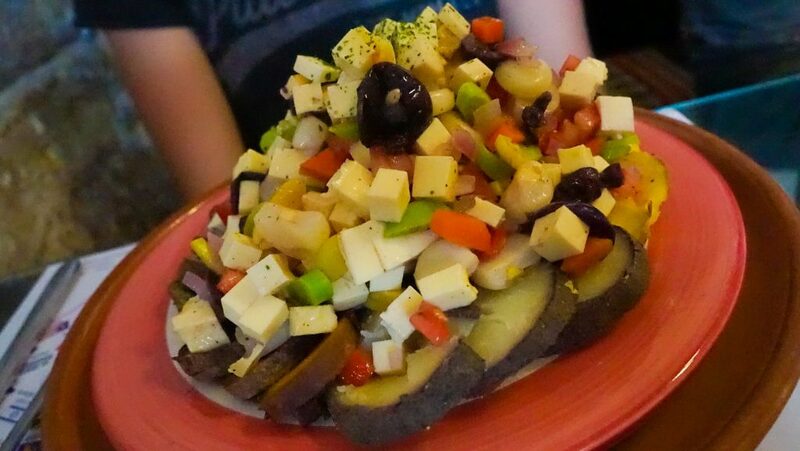 Fortunately, or sadly, no cheese is used in its making with the name simply coming from its original preparation in which the dish looked more like sliced cheese than ice-cream. Queso helado’s flavour is akin to rice pudding mixed with cinnamon but is made from sweet milk with a dash of coconut, or more commonly cinnamon. 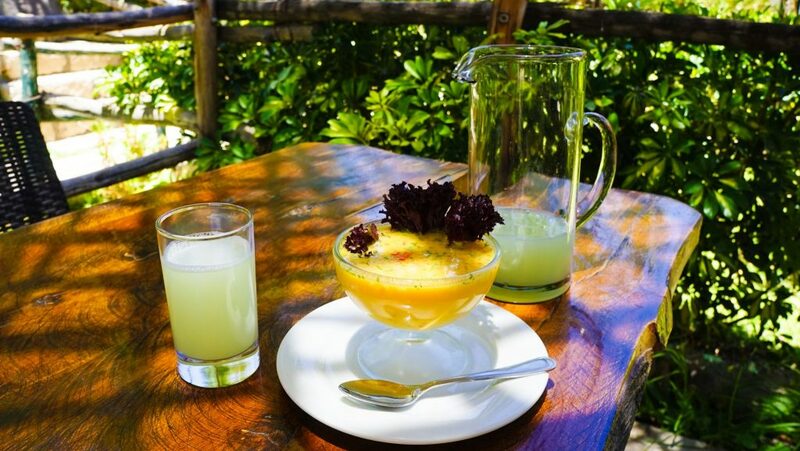 As you may soon guess by its frequency Arequipa is the birthplace of this fabulous treat. We all agreed it was one of the best ice-creams we had ever tasted and it’s unique flavour helped cool us in the sweltering heat. Just look for the loving lady on the corner mixing something in a cart – she will offer you three sizes ranging from 2-5 soles. You’re welcome! Third stop. 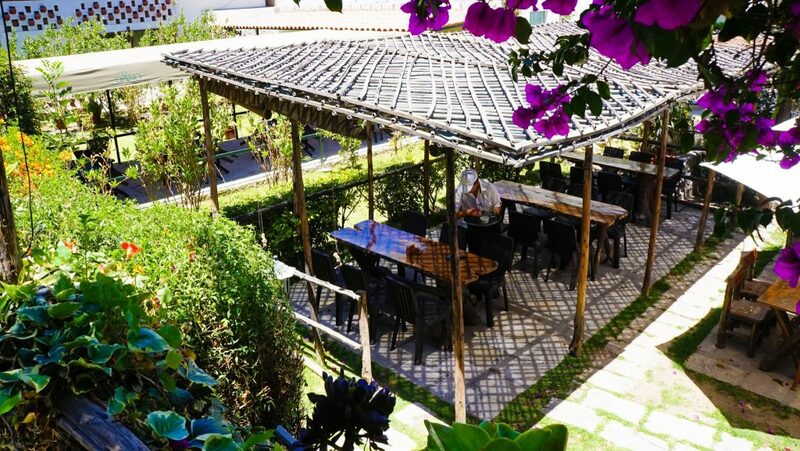 Just around the corner in a picturesque alley you will find El Tio Dario – a true hidden gem! Specialising in fresh seafood and fish this is a place to get your ceviche fix- I had visited on a previous trip and wasn’t so hungry so opted for a light meal of Leche de tigre and some ice cold lemonade in their beautiful sunken garden. Leche de tigre, or tiger’s milk, is a dish using the citrus-based marinade that is used to ‘cook’ the seafood in ceviche – it normally contains lime juice, sliced onion, chiles, salt, and pepper …and of course some ceviche. Its a bit of a ‘leftovers’ meal but I love it, an invigorating concoction served cold in a small glass. And its name – ‘tiger’s milk’ – well, its known as either a hangover cure or a potent aphrodisiac, depending on who you ask! 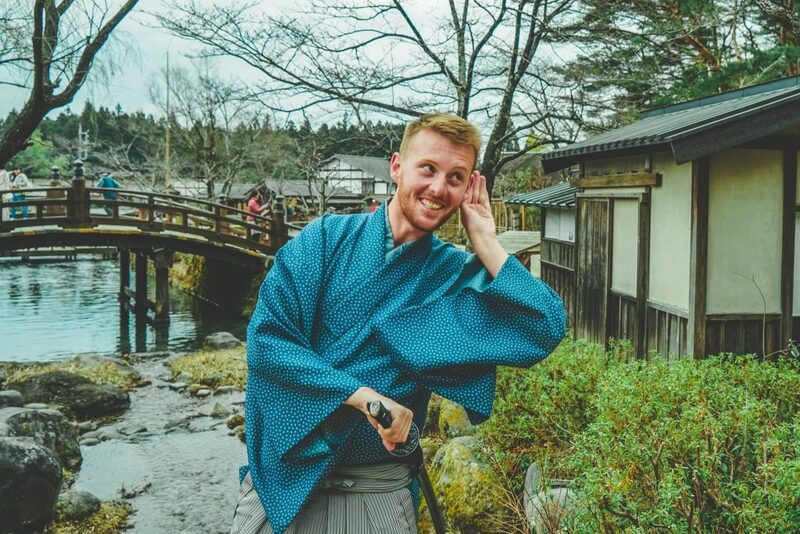 If you have a bit of an appetite I truly recommend this place as a splurge restaurant as it is so fresh and delicious – the locally caught river lobsters are to die for and the menu is extensive and innovative. La Paz Cable Car in Bolivia; Worlds Coolest Public Transportation? Forth stop. I’m sure your getting full now – we are definitely thinking we should have split over a few days! 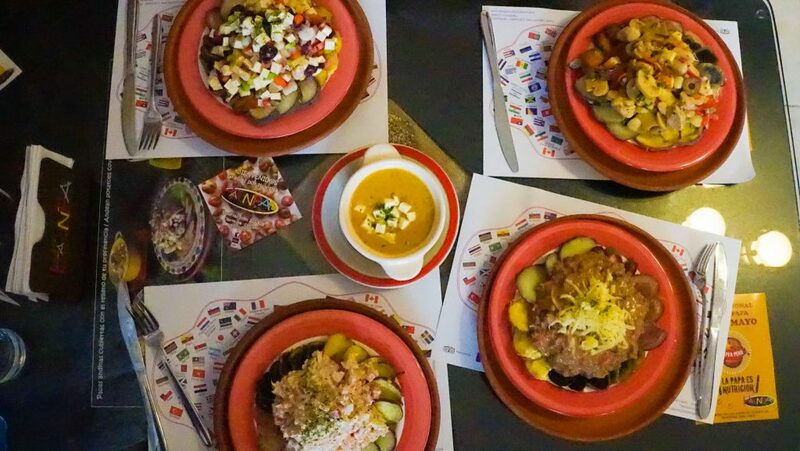 Back in Centro we visit Hatunpa, an innovative potato restaurant which offers varieties of sweet and Andean potatoes with delicious toppings. Seems mundane but it is anything but – I opted for tuna (the best I’ve had in South America) and a extra portion of Ocopa – a spicy, peanut sauce which is unique to Arequipa. Weird and delicious, this quaint place with only a few tables is a cheap-eat with a lasting impression. Cost around 20 soles each including a drink! Fifth stop. We can barely walk now, an afternoon siesta could be in order, or enjoy the unique Sillar architecture of the old town – a unique fusion of European and Indigenous design utilizing the regions white volcanic rocks. To appreciate it best we headed to Hotel Katari on the Plaza de Armas at sunset for easily the best view in the entire city. The Basilica Cathedral of Arequipa with the looming Misti volcano set behind, icons of the city, stand before you on this hip rooftop terrace, complete with real grass. Surprisingly affordable, mojitos or pisco sours only set us back 15 soles each – not bad for the best hotel in town! Wrapped in blankets we watched as the white buildings on the Plaza de Armas changed in sunsets soft red glow. Every second the view was changing, until darkness fully came. Truly unforgettable and not to be miss in Arequipa! Sixth stop. 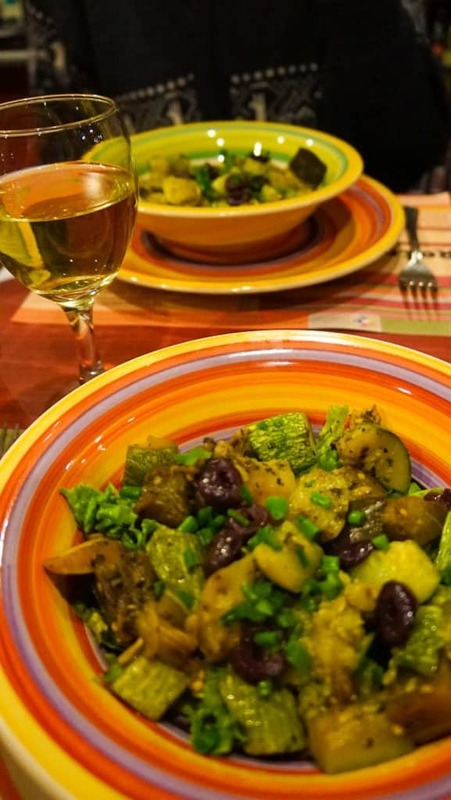 After the suns light was long gone we meandered down to Ratatouille – the cheapest French restaurant I have ever been to, in price only, and easily one of the best! A local Arequipa institute and famed for their 12 soles set lunch. A 3 course meal here with a few glasses of wine ran up 50 soles each, a complete bargain given the quality. 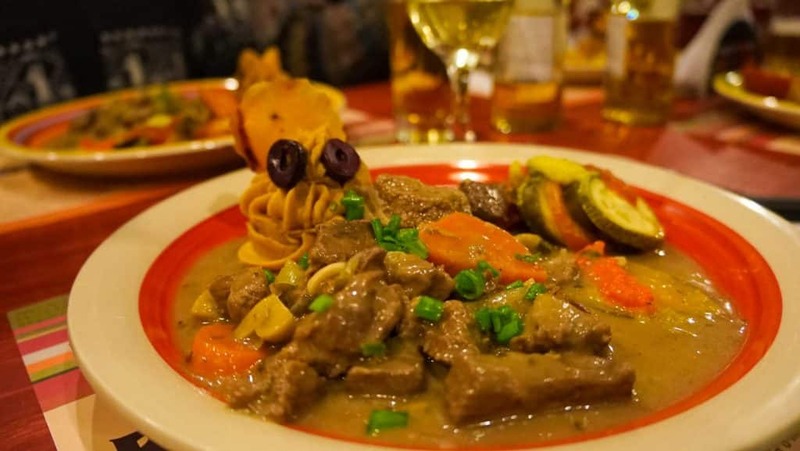 Ample wine, deliciously tender beef bourguignon, creamy potatoes and plenty of fresh vegetables – a rarity in Peru. We were too stuffed for dessert but they looked incredible! As we waddled of home we chatted about how we had not eaten this well in months. Everything was perfect, but the shear variety of prices, food and locations we had covered was impressive also! 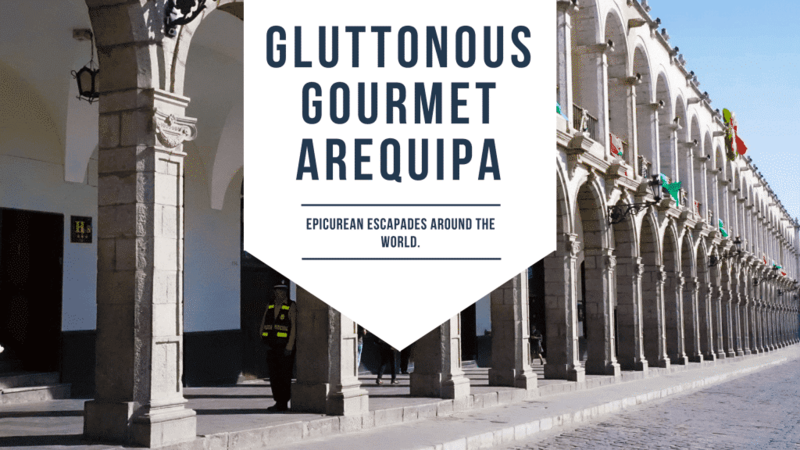 Arequipa – I came, I saw and I ate – and I definitely run this Epicurean Escape. Until next time!! Let me know what you think of Peruvian food in the comments below. If you are going for food in Arequipa I highly recommend these choices but if you have other recommendations please also let me know. If your now inspired here is some more things to do in Arequipa. And while you are in the area don’t forget to check out the incredible Colca Canyons! Enjoy! P.S. Thanks to Peru Hop for providing us with a bus pass to get us to all the amazing destinations in Peru!